Mokuren Dojo: Where's their face paint? You know, I've always thought judo was cool because they mostly managed to avoid all the crazy fads that overcame some practitioners of other arts. Flamboyant red-white-blue stars-and-stripes uniforms... Tassels, epaulets, stripes, belts of every color imaginable... Every square inch covered with logos and advertising and the name of your sensei/sifu/guru... The introduction of the blue gi as an optional standard in judo was a little scandalous to me, but I got over that pretty quickly. 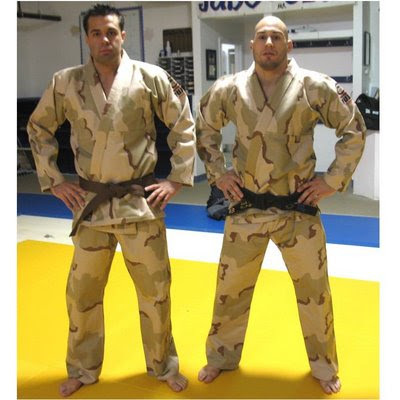 The new camoflage gi! What I want to know is this, are they trying to avoid being seen on the mat or are they doing judo in the desert against real enemies? Hilarious. I got the same email this morning. It's a bit odd to me that the camouflage doesn't fit any established pattern. I do seem to recall a Human Weapon episode where some Russian guys were wearing a camouflage gi that looked intriguing. That's not, however, the only camo gi I've seen. But if you want to see unorthodox, I think this one takes the cake. Good catch, Steve. I think the camo gi you referenced is even dumber than the one I found (notice the camouflage effect is ruined by the bright white and red logos and adverts). As for the different cut and skirt length - i've never been one to put much count on playing the rules like that, though some much smarter competitors than me assure me it is both a kosher and necessary part of the sport. I'd rather be able to throw the guy no matter what he's wearing than to depend too much on him or me wearing the right thing. What I want to know is, where are their necks? Somaserious - you can't see their necks because of the camouflage! Ha!!!!! I feel so silly now!